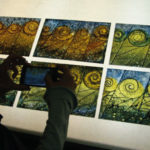 Advanced Glass Painting: 2-day workshop – PELI Glass Products B.V. This intensive workshop has a full program! You’ll have the opportunity to work with various glass paints, with different mixing techniques from traditional to modern. All are very high quality paints and we’ve been using them for years. The best way to learn is by actually doing so it’s a very hands-on workshop, with several projects going at once. Participants are required to have some experience with glass painting and to bring certain paintbrushes and a palette knife. As a workshop participant you are entitled to a 10% discount on all paintbrushes, and 10% discount on all paints in stock purchased from PELI Glass (sets not included) from time of payment for workshop through end of workshop. 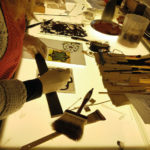 During the workshop PELI Glass will provide you with: A red sable contour brush, designs, all paints and silver stains, mediums, glass, use of the kilns, lunch, drinks/coffee, printed Workshop Guide. Workshop presented in Nederlands-English. Minimum 3, maximum 4 persons. Check out more information in our webshop here.